The power of fandom and social media has been proven once again, this time by the creation of Hallmark Channel’s “Marrying Mr. Darcy,” which premieres on Saturday as part of the June Weddings event. The sequel to the network’s 2016 hit movie, “Unleashing Mr. Darcy,” comes after a couple years of enthusiastic fans making it known that they wanted it, and no one's happier about this outcome than star Cindy Busby (Elizabeth). 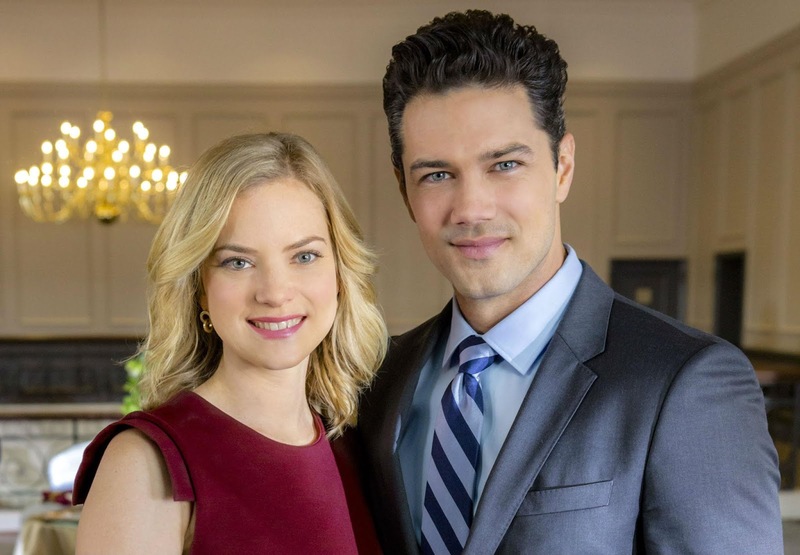 She and “General Hospital” alum Ryan Paevey (Donovan) are both reprising their roles in this sequel, which follows the two as they take their six-month-old relationship to the next level. International Business Times caught up with Busby to hear more about how fans made this movie possible, if she’d like to do a third movie and which “Marrying Mr. Darcy” scene fans will love most. Cindy Busby: It’s funny because “Marrying Mr. Darcy” started being talked about seriously about a year and a half ago, and I had worked with the producers again on the “Hailey Dean Mysteries” for Hallmark channel, as well, and so they had said, “Yeah, we’re probably gonna — it’s looking like it’s a go” and all this stuff for “Marrying Mr. Darcy” and I was like, “Oh my goodness, really?” At that point, it had just felt like something fans just craved and wanted, but I didn’t know it was actually going to be taken seriously. And then all of a sudden it just happened and now we’re done and it’s about to air and it’s really, truly amazing how much social media really has so much power over what networks and studios decide what they’re going to put out there. It’s a different industry now and fans just have so much more control, because they’re the ones watching it and it totally makes sense. And back when we were young, that’s definitely not how it was. So, it’s a really cool thing and I think engaging with the fans is so important because if it wasn’t for them, I wouldn’t have a job. They’re the reason I get to do what I love. That’s everything. IBT: Do you really think it’s because of the outspoken fans that this movie was made? Busby: I am 99.9 percent sure that is the reason. The other reason being, I don’t know. Faith, hope, I don’t know. IBT: Would you want to do a third move in the series? Busby: [Fans are] already talking about perhaps having a third one, which would be incredible… Everyone is so excited, which makes me so excited. That’s the reason I do it. For people to love it and watch it and want more of it. IBT: So, you agree with the fans and would want another one? Busby: Oh, absolutely. If schedules worked out with everybody, I would 100 percent love to do it because I just honestly love everyone in that cast and crew so much. I would definitely do a third one if the opportunity came. IBT: How was it stepping back into the role of Elizabeth? Busby: At first, I was a little bit nervous because it had been almost two and a half years when we started shooting the second one. [But] it’s amazing how comfortable I was putting those shoes back on to play Elizabeth. Ryan and I, we would talk together, and it’s amazing how much life has happened. We’re all very different people. We’ve all lived so much since we last shot, but it felt like no time had passed at all, which to me is indicative of how right it is to be all together and to do this. That’s pretty special. IBT: What’s the biggest difference from the first movie to this one? Busby: The biggest change you’ll see is how a lot more comfortable they are together. So, it’ll be just be a lot more loving and showing a lot of affection to one another. You’re seeing a different side of the characters because in the first one, you’re seeing them a lot more in the dog shows and that aspect of the movie was strong versus this one, it’s a lot more family life, work life. IBT: Which scene do you think fans will really love the most? Busby: I think everybody’s really going to be excited about the proposal, which is really sweet. Elizabeth is kind of at that stage in her life where she isn’t necessarily expecting to be proposed to, but she’s very excited about it because she’s so in love with Donovan and she’s just ready for the next step to be with him, and to live with him and to eventually have children together.